....for how to reset the balance between work and debt. 1) Measure how financial obligations expanded faster than the physical economy, by month, back to say 1980. 2) Using the authority under the commerce clause, mark down remaining repayment demands in proportion to the falsely inflated value they contain. 3) Give all earners a "very large bonus" (printed money in proportion to their earnings) to restore some of the value robbed from them by the collapse of overinflated financial values, and provide the floor for recovery. 4) then... start "marking the money to reality" all the time (i.e. finally make the rules of money sustainable). Even when people are not "gaming" the system, distortion can develop between the money market (trading financial instruments), and the product market (trading physical goods and services). Physical products can't be created by imagination alone, but information products can, so things like circular price inflation for artifacts not changing in value (like real-estate) can take the two markets in different directions as a whole. That creates falsely inflated information about the future value of both artifacts and business investments. It's not that individual deals could be somehow judged for how much "misinformation" they contain, but that a disconnect can develop between the real scale of the product market and the real scale of the money market as a whole, even when both are operating "properly". Letting so many physical businesses collapse as the false valuation is readjusted, makes the harm being done far worse. It's possible to make a sweeping change, by executive order, to prevent the worst of the damage. To understand this proposal, first understand how information about wealth can change independent of the physical capabilities to deliver goods and services. We can regularly adjust for inflation, but that is only for money circulating in the goods & service economy. That's responds to the false measure of the normal circular economy, as people charge more than their goods and services than they are worth in physical relation to each other. What about money inflated in just trading ownership in a circle, that represents the value of goods and services only symbolically? We need a better way to reset the value of investments to reality than economic collapse. It may take asking questions and rereading and asking more questions for us to discover what the workable rules should be. The industrial economies had about 200 years of relatively unbroken rapid real growth, that "we believed" would never end. We made the extraordinary mistake of building all our modern institutions, theories and ways of thinking around assuming that the past continuous multiplying scale of wealth would last forever in the future. That misinformation is now built into our culture and institutions and is what we really need to correct. That definitely can not be done "by executive order". Expecting enjoy what is completely impossible in the physical world is the root cause of our having continued to multiply money promises when environmental constraints were clearly growing and money values being clearly distorted. We need to learn how to track reality. To design implementations, remember, though every model may be bad "a bad model can still make a good question". The question is always, what does it accomplish, how does it fit and where does it lead? but since about 1960 the growth of real wealth has been slowing. . The problem is that our information is part of our cultural universe and sometimes the physical universe works differently from how we think it should. We just don't get nature's signals. It's really the "money game" that created a false impression about the world that is bankrupt and our information about reality that needs adjustment. That information adjustment need not cost the death of so many find cultural institutions. We knew that limitless multiplying money did not fit with a world in which there is "no free lunch", but we didn't know how to act on that. Resetting the money game as if it was an errant computer that got off track, to erase the false information that accumulated, would be far less disruptive than the implied general bankruptcy we're heading into. In principle you can just slash the unreal obligations businesses entered into rather than the businesses. Resetting the debt is one of the very few physically possible ways to 1) quickly rebalance the system, 2) relieve it of excess burdens, 3) being fair and considerate regarding individual circumstances. If we do it we save the physical institutions that would otherwise be lost and the recourses needed for global warming and other efforts to become sustainable in the long term. Holding society responsible for the obligation to provide finance an endless multiplying free lunch will not do that. Alt A: reset the value of savings - what this page is about, using 'debt' as the portion of 'savings' to be changed by executive order. It is a very last ditch sort of thing, for our being in the last ditch of a very long process of deteriorating financial condition. It's both dangerous and would quickly erase the reason for the deflationary spiral. Alt B: spend income from capital - That rule would distribute 'unearned' income by way of spending to prevent the situation that Alt A becomes necessary for. It's like Keynes' solution for economic climax. Because financial earnings come from labor earnings, they need to balance. A full physics theorem shows, that 'financial income' (earnings from ownership, without proportional work and energy) need to be spent rather than reinvested in a physical economy where 'labor income' requires proportionally increasing work (i.e. using energy in physical systems). The physics has been solid since I wrote the proof 25 years ago, but the professional bridges needed to publish it in an economics journal could not be built. Alt C: print money to deflate excess debt - this is a drastic solution similar to Alt A, just estimate the amount the system has accumulated wealth production obligations in excess or the systems capacity to produce them, and hand out money in that amount. If debt creation was three times real earnings then print three times real earnings and distribute it it to people in proportion to their income scale. If we are to find the error that is causing wealth to collapse, it’s to ask about trusted ideas that were mistaken. We’ve acted as If the markers of money were the real value rather than the living social. business and environmental systems that make them valuable. We started the problem by multiplying money faster than real wealth was being created. When that was exposed we then withdrew money from circulation ‘for safety’ and started a downward spiral of shutting down the circulation of money from which it gets its value. In both cases treating the money itself as having the real value directly threatened the security of what gives it value. It’s a definition problem, and a large residual from it can be redefined. Because a great deal of debt was created with money not backed by the performance of the living economic system, we should erase some of it in a practical way, and get ahead of the deflationary spiral that is erasing our institutions as its way of correcting the imbalance by natural processes. I’d say that once the dust settles there may be tort claims, to settle particular harms, but for now I’d just gauge the degree to which money creation exceeded wealth creation in total, and mark down all debt accordingly. My guess is that is on the order of a factor of 4 so the mark-down of all debt would be 75%, just by executive order. Relieved of that excess burden the economy would stabilize quickly and naturally, and then the transition to new technology and a new understanding of money could begin without further delay. That estimate could be off by a factor of 2, and some ‘shock absorber’ reserve is needed, but it’s the right general solution to get ahead of the spiral. RESETTING ECONOMIC BALANCE - Draft, 2-2/27/09 - (as for Alt A above ) The basic scheme is to measure the divergence of financial obligations in excess of real earnings, and then either discount the excess debt or inflate earned incomes to bring them back in balance with debt. In reality the Alt D mixed approached is what would be done, for speed and manageability issues. What happens to "the markets"
If the delivery of goods and services stabilizes, then the markets will too. What's important, though, is not the apparent value of the physical economy to the money markets, which now price the value of physical assets mainly in terms of how fast their value will grow. Giving the physical economy ever more "steroids" to boost its growth artificially is unhealthy. That's part of what failed us. Economic stimulus is normally thought of as "seed money", someone giving someone else money for a productive use and getting a % more in return for the favor. From a physical system view that is both that, when productive things are what it is used for, and also a cycle of putting money into the economy for goods and services in order to take continually increasing amounts out. That's because the returns are added to the investments and so as long as people make good on their promises the promises grow. From one view it works as feeding a hungry system to find more creative uses of the earth, and from the other it's the endless "trickle up" economy stimulating the system for to make growing amounts of product it eventually can't produce in the end, and then switching the use of the growing investment funds to bidding up the price of property of one kind or another. So, what you can say with some certainty, is that the economy collapsed from over-stimulus, and lasting debt relief rather than continued increases in stimulus is the solution. Keynes' General Theory and Boulding's Reconstruction of Economics address the natural climax of wealth in terms of the need for the wealthy to spend their profits when the physical economy becomes unresponsive to growing investment [chapter 16 "Observations On Nature of Capital" in Keynes and chapter 17 note "Economic Cybernetics" in Boulding]. The proposal here is a variation on that, offering an unusual rapid way for the wealthy to spend enough money to bring the information economy (money) back in line with the physical economy (value) when failure to keep them aligned led to a global deflationary spiral of excess money expansion and then collapse. To keep the money and the physical values in balance the lending needs to stop multiplying when the goods and services do. They don't tend to because of continual reinvesting of returns unless the average rate of returns on money goes to zero, the dilemma both Keynes & Boulding pointed to. Below are figures adapted from my 1983 proof of this principle, treating economies as physical systems regulated by money as a marker of value (General Allocation Theory). Based on the natural limits of how fast learning can respond to accelerating rates of change in increasingly complex tasks, an investment economy will meet diminishing returns on investment in the delivery of goods and services. 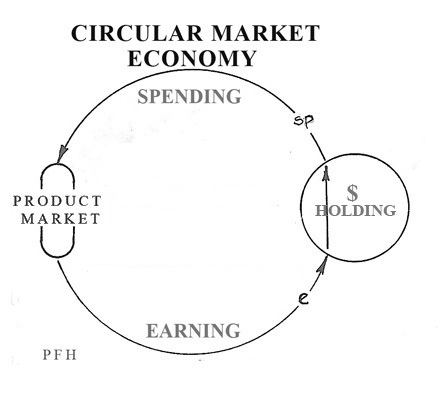 When the money supply stays in balance, development follows the learning abilities of the system, that like a simple circular economy can be perfectly stable and continually develop too. 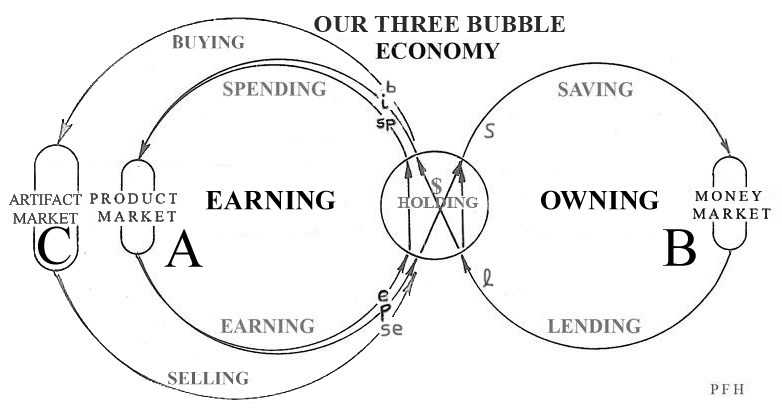 When the money supply is driven by automatic reinvestment of returns, as in our economy, growth is driven by compounding returns, naturally exceeds the learning abilities of the parts, and creates a three bubble economy. A - Product Market - inflated by consumption. The product market has been stimulated to consume non-renewable resources ever faster for 200 years. We now have a large learning gap as to what to shift to, running short. No substitutes have been found at near the price our society was built for, so increasing our use of diminishing cheap supplies creates a physical dependency and overshoot. Because of misdirection and demonstrable slow learning, the bridges to new systems may not get built and there’s a potential for physical system collapse. B - Money Market - inflated by manipulation. When the returns on investment for making useful products started to decline in the 1970's, partly due foreign competition, resource conflicts and whole system complexity, the ‘need’ of investors to find places to put multiplying investment earnings to further multiply them, stimulated numerous ways of "making money" by creating expectations alone, with no earnings to speak of. C - Artifact Market - inflated by speculation. Starting in the 70's investors bidding up the values of housing, art and other property or scarce commodities provided the illusion of multiplying value, and was used as an expansion of money for expanding consumer debt and consumption beyond earnings. The one thing that no one is attempting to regulate yet, that automatically results in uncontrollably pumping up all three of our systemic bubbles, if not regulated, is the customary practice of using returns on investments to add to and so continually multiply investments. Lots of discussion is definitely needed to make sense of how to prevent that from compounding false expectations wherever people put their money. Still, it should not be a guaranteed right of ownership to employ a society's profits to multiply a society's obligations to a point of societal collapse. That, however, is what has happened to human societies over and over again, seemingly only because we have not been able to understand the direct cause and effect. That appears to be the heart of the dilemma. We have to give up our favorite thing, the windfall of having what seems to be a guarantee to each person of an endless multiplying "free lunch" if we just take advantage of it. It is a false hope and promise, highly destructive to all we actually care about, that necessarily results in societal bankruptcy and failure for reasons that continually confuse us. Other factors contributing to our "perfect storm" are, 1) everyone's general detachment from our real world problems, 2) the trade imbalance caused by China and the oil producers who are not using their vast earnings for buying products from the developed countries, but flooding the world market with investment funds instead, 3) the emerging conflict between food and fuel markets as they begin to compete for the same resources, making those resources globally scarce, causing a world commodity price spiral of ~25%/year for the six years immediately prior to the financial collapse. There are surely lots of technical issues to be resolved. To me the main ones are to first estimate the degree to which the obligations of the economy were inflated beyond the capacities of the economy by excess money creation. Then talk to experts in each field of interest about what the possible effect of resetting the obligations of the whole system to equal it's capacities, instead of allowing deflation to do that for us. To estimate the excess obligations that built up in the economy I'd look at measures of sustainable progress, say the growth of earned income (rather than unearned income), locate the inflection point that begins their divergence. The excess of obligations would be the proportional divergence between the two from that point on, less what has already collapsed. I'd be happy to contribute to the discussion, of course. This intervention is designed to correct one of the oldest of misunderstandings of mankind, the mistake of interpreting our information as the thing that the information describes, discounting the real. Information needs to both point to it's origin and connect to other information. Doing just one or the other is highly dangerous. Money is not the source of it's own value, but we've been habitually treating it that way. I have a recent paper (1) on the wider implications for science and ideas, but clearly it's all going to be a learning process, with everyone needing to make their own discoveries. My web site is also full of references to this problem and the possible ways for people to begin to see how to consider their information as pointing to the physical systems of the world from which the information comes, but my efforts in just conveying the problem have been handicapped by how strange it sounds. I don't like capitalizing on a very unfortunate turn of events to bring attention to my work, but this misfortune is for all of us, and misfortune in general, can often be used as a learning opportunity. I do strongly believe we should do that. There's a second important way that believing our information was the reality has misled us about economic reality. Our culture experienced a few hundred years of finding that increasing investment would increase the availability and decrease the costs of things. We were able to always develop more and more ingenious ways to use natural resources that seemed ever more plentiful because of that, and we designed our entire economic system around that principle. Because it seemed ever more investment would make natural resources ever more plentiful, we designed finance to always use a part of the profits of investments to continually add to the scale of investments. As with any natural energy system there is a natural point of diminishing returns when the system's seed resource is coming to an end. Because we believed our information we designed all our institutional structures for that never happening. So, we're being caught having a whole system of thinking that has become outmoded. I've been writing on the subject since the 70's and developed a whole scientific method for developing new systems of thinking for each natural system you try to understand, as they all exist as somewhat unique individual universes of original relationships, all emerging out of the large space of possibilities "within the laws", you might say. The 'big switch' every natural development system needs to accomplish to become sustainable is the switch from continual compound growth & multiplying returns to stabilizing growth to becoming self-reliant with seasonal returns. Phil, Please draft the executive order you have in mind. Use, as they say in the bureaucratic trade (where I spend my day job) "plain language" - as plain as possible and concise. If it's compelling we'll work on advancing it. It won't happen (yet) but the effort will educate people. Draft order for resetting the excess obligations of the economic system. It’s possible to measure how far debt obligations grew by unproductive compounding beyond the real economy’s ability to pay them. We should do that and to use for redefining debt obligations throughout the economy, to be reduced by that much. The intent is to find a simple rule that could be put in place quickly, get ahead of the deflationary spiral and remove the toxic obligations that are causing it. Such an order would need to be discussed with various experts and, if possible, issued by all countries at about the same time. The problem is with the global financial markets and so the responsibility is universally distributed. Some countries may see it to their advantage to ask for exceptions for certain classes of debt. I feel that where it would be of mutual advantage such negotiated adjustments could follow rather than lead the arrival at a consensus. To measure how far unreal obligations exceed real earnings one needs measure their divergence different ways and compare. The technical detail is to set compared measures to their own scales, set to be equal at the point chosen as when they started to diverge, usually the turning point in one of the curves. One might compare GDP and earned income curves, for example, and see that they began to separate around 1970 possibly. The implied mark down in the value of debt obligations made after that would be the amount of the divergence. If to bring them back in line meant reducing all debt by 75%, then a creditor holding $100 in obligations from others would end with $25, and a debtor with $100 of obligations to creditors would end with $25. Credits equal debits. As of the close of business yesterday, the recognized value of all debt obligations will be reduced by 75% for recently created debt and less as scheduled for all remaining obligations created after (say) 1980, to bring the financial system back in line with the economic system. Transactions in progress or to be reconsidered may be adjusted by agreement and in the interests of all parties involved. Dear Phil, I think you're headed in the right direction. The ancient Hebrews were onto something with their jubilee year of debt absolution! There is the parallel problem of money *flow*, which in economic terms is sometimes more important than capital. The factor by which money exchanged for goods ans services is exceeded by money exchanged in pursuit of other money was an astounding 50:1!!! All of which meant that the *real* economy was the tail being wagged by the financial realm. No wonder distortions were rampant! How that 50:1 flow ratio translates into capital ration, I'm not sure, but you may not be far off the mark. What's important, I think, is to start from the functional/dysfunctional requirements, and then adjust for practicalities and value judgments without loosing functionality. Having money and debt obligations guaranteed to multiply exponentially by allowing reinvesting of returns insured to not fall below the nominal interest rate, even when the real circular economy of goods and services is not growing, is one of the most unforgiving structural distortions at the heart of the matter. Aleks, I guess whether people's retirement savings are hurt "depends"... The books all balance, with the +'s equal to the -'s. If the physical system owes several times more than it can possibly deliver, then the +'s and -'s need to be exchanged without deflating the physical system as is now happening. The physical exchange of goods and services stopped multiplying freely when we started running into natural limits, due to the complications of working with a physical world. The money kept multiplying by creating debt obligations that couldn’t be paid. Maybe you have a just claim, that my scheme would reward mostly the people in the worst debt, and that some of the people reaping rewards from the false escalation of values were unaware of where their money was coming from... Money has no value except the good health of the economy, though. I still think the way to balance the system is to correctly redistribute the false credits and debits. Those who got good at it and just did it as a game using money to 'keep score' were fools too, like nearly all of us, and would have the most to lose. Yes, that means that some part of the retirement savings of people, in my age group, were built up on false pretenses, and some of their assets would be in fixed income debt securities that would be devalued as I stated the simple principle. Those who just lived within their means and 'stayed out of the game' are not an especially favored group in my mind, but they'd certainly deserve to not be disfavored if some people get special treatment for their personal retirement savings, for example. The idea is to distribute the sacrifice in a way that will mainly cause the loss of expectations and not result in the loss of the institutions of our life support system. One way everyone would gain is by lowered taxes, when government debt is devalued in the same way, for example. You might think of that. When the bean counters get to look at it more issues would come out of course. The idea is to cancel debt by taxing the accumulated profits of those who were obligating the physical system to deliver more wealth than it can. It's an attractive proposal, that aims nicely at the right scale of intervention. Sounds like the idea is to avoid the hardship caused when assets devalue but debt doesn't. In a standard bankruptcy debts are 100% cancelled. So is your idea a 75% bankruptcy for the whole economy? Should it be done globally? If US debt to China is unilaterally shunk 75% then it becomes global automatically. [ph] yes, essentially, this is “game-ruptcy” not bank-ruptcy, to reset the game so the markers equal the physical value of the goods and services. The alternatives seem to be to find a rule to fairly devaluing the debt or to fairly inflate everyone’s credit, either by the same degree. If they diverged by a factor of 4 then you could give everyone 4x their annual earned income and accomplish the same thing. I think people would possibly rather feel that they get to cheat the cheaters, though, except when it turns out to be your grandmother… That is one of the interesting complications. I like the terms earned and unearned income. Are there accepted definitions and measurements? [ph] yes, in the tax code. One pays capital gains rate and the normal tax rate on the other . Some new kinds of income to avoid unearned income rules may get invented, where earning not proportional to physical effort or service could potentially multiply without end and create the fake appearance of value (like a Ponzi scheme). Watching out that exceptions don’t inadvertently break the natural rule (i.e. no unnatural compounding of wealth markers) is needed. Would your idea guide new levels of asset prices, at 25% of peak prices? I guess the aim would be to head off even bigger falls as in the Japanese 90s property crash. Could it be done incrementally, say 50% cut first and then another 50% later to achieve your 75% target? 50% is a rounder figure with a kind of internal logic (we were half right and half wrong) and allows for a series of halvings as needed, so there is no need to guess in advance at the right figure. [ph] Yes, that’s just the kind of simple rule approach needed. It is better, ideally to phase things in. In this case you don’t want to reward people for worsening the flight to safety that is the actual black hole the system is being sucked into. There may be a smart way to prevent that, and allow the implementation to be phased in. I'm not sure about the zillionaires. If they lose 75% of their stash they're still zillionaires. If regular people lose 75% of savings there will be a lot more hardship. Are regular people more protected than I realise? Or can they be more protected somehow? [ph] Yes, that’s an issue, but someone has to do the math. I tend to think if you take it all from the wealthy gamers there wouldn’t be near enough. There could be a simple proportionality curve drawn, somehow. This is basically a onetime asset tax and it could be progressive. Suppose your idea is done and the money supply is rejigged to match physical value then the economic part of the problem would hopefully have been cleaned up. Then the next step would be create physical value in the larger system including nature. A pretty seismic shift for economics, which only recently noticed that something was happening to nature. This is where the 'forward gear' metaphor might be used. [ph] I agree, that’s the big advantage of this ‘shortcut’ in that it keeps you from having to waste so much government resources on stabilizing the collapsing old system, and lets you turn directly to inventing a truly sustainable world free of the idea that endless disproportionate growth is sustainable! p.s. I meant to look at the blindspot web page you said you’d worked on, but wasn’t sure which one. Could you give me the link?